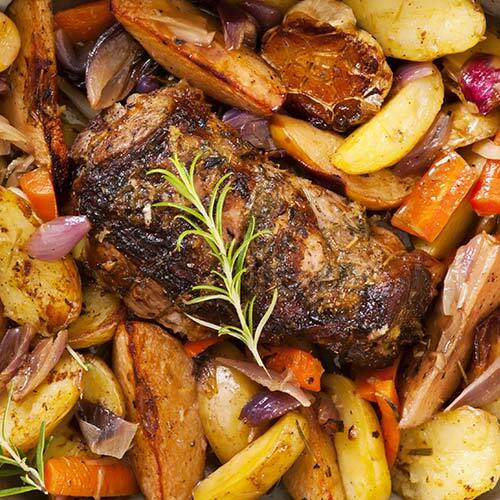 This roast lamb is the perfect traditional Easter meal to serve family and friends! Enjoy with roasted veggies. 1. Tip: roast a leg of lamb for 15 minutes per 500g plus 10 minutes extra. 3. Drizzle olive oil in a large roasting pan, before placing the lamb in the middle. 4. Slice the lamb legs 4-5 times across the top. Push a garlic clove in each slice, generously sprinkle with sea salt, pepper and fresh rosemary sprigs. 5. Arrange potato wedges, carrots and onion around the lamb. 6. Roast for approximately 1 hour or until lamb is cooked medium (slightly pink). Rest for 10 minutes before serving.